The Marathon (No Spa) is our beautiful lap swimming fiberglass pool. Its elegant 34′ length & 8′ 6″ width is perfect for supporting dual swimmers for some recreational swimming. This is a great swimming pool for our clients who enjoy the great outdoors and require moderate to rigorous physical activity on a daily basis. Hop right on in, throw down a few laps and burn those calories. The Marathon (No Spa) model is the perfect swimming pool for our clients who love rigorous swimming. In fact, this pool is designed to be your perfect workout space within your very own backyard. From your standard recreational swimmer to the serious athlete, the Marathon was designed to suit swimmers of all kinds. Now, you might have guessed by the name: “Marathon (No Spa)” that we had another model that includes a spa. If this was your consideration, you’re absolutely right. San Juan Pools also offers this pool’s big sister titled The Marathon (with spa). There is really only one difference between the two: whether or not you get a spa. Now, this is a great opportunity to point out that San Juan Pools also features a great lineup of fiberglass spas. These gorgeous spas can be purchased individually or paired with a model such as the Marathon (no spa). If you have some question, feel free to fill out our contact form and we can get you in contact with our installation experts who know these spas the best! In addition to our spa / no spa options – we also offer some other great features to the Marathon (No Spa) model. 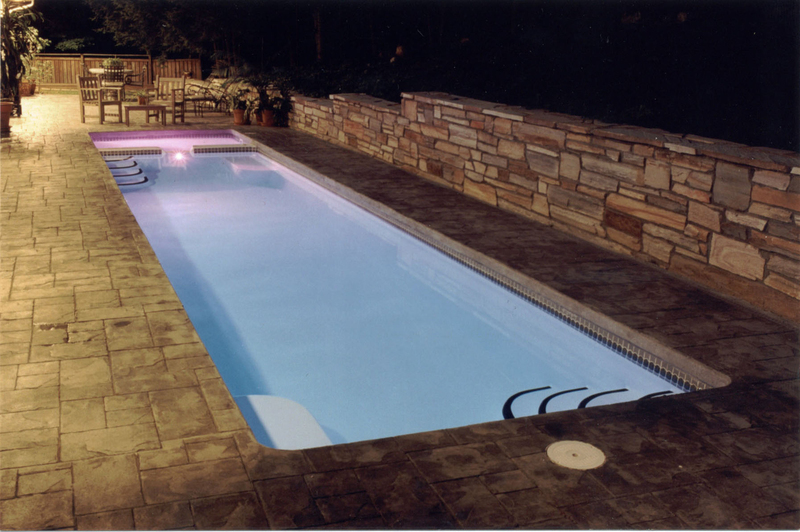 For starters, this gorgeous lap swimming pool includes a 4′ 9″ flat bottom design. That means that there is no deep end and it has a consistent depth all the way across this pool. In addition the Marathon (No Spa) has a total length of 34′ and a width of 8′ 9″. This provides plenty of room for dual swimmers or a wide space for a single user. 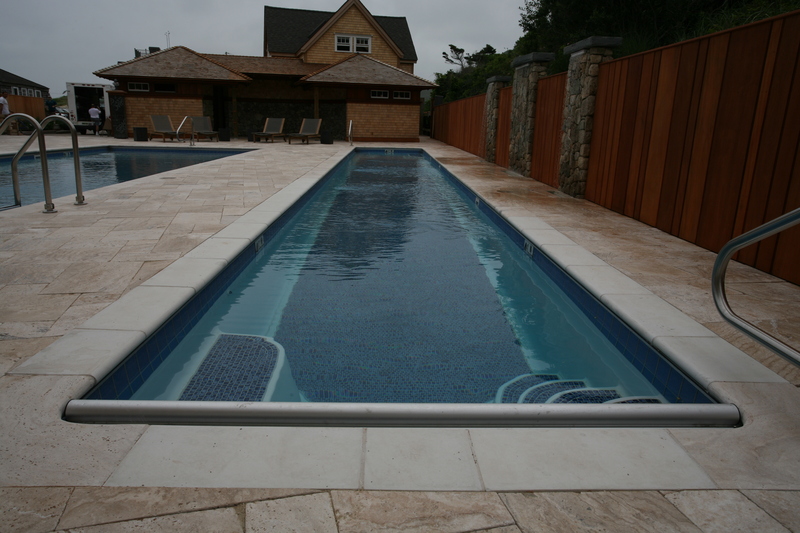 Either way, we’ve designed this pool to represent your classic swim lane for both comfort and familiarity. One additional feature we’d like to point out is the Dual Entry Steps & Dual Bench Seating of the Marathon (No Spa). Our steps & bench seating is parallel, yet opposite. Therefore, the steps are on opposite corners while the benches are opposite as well. 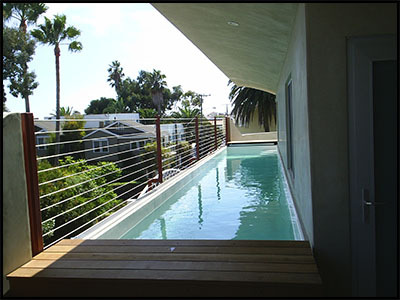 It’s a unique design approach that adds a modern twist to the standard rectangular layout of this pool. In conclusion, the Marathon (No Spa) is a beautiful rectangular swimming pool. This swimming pool is designed for moderate to rigorous athletes who crave that physical exertion in their own backyard. The Marathon (No Spa) provides plenty of space in its overall 34′ length & 8′ 9″ length. You’re sure to enjoy its flat bottom layout as well as the modern design twist of the steps and benches. We’re sure your going to love the Marathon (No Spa) as well as the health benefits you’ll receive from its use!